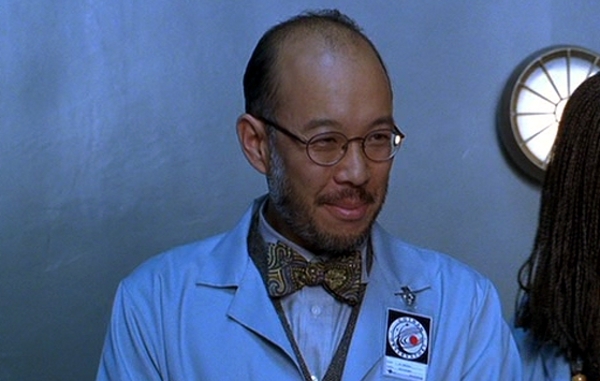 Movie Beards: Dr. Lee: "Batman & Robin"
Dr. Lee: "Batman & Robin"
That's right. Before having small roles in Joel Shumacher's neon train wreck Batflicks, Michael Paul Chan had a more memorable role in another (infinitely better) Shumacher film: Falling Down. If you've never seen Falling Down, I highly recommend you head to your nearest video rental store Netflix it at your earliest convenience to simply remind you that Joel Shumacher once knew what the hell he was doing. All Cokes aside, let's cut to the beard, shall we? The last time Chan graced us with his beard, he was playing the role of a handwriting-analyzing, tissue-dispensing, Business Bearded Executive at Wayne Enterprises in Batman Forever. His character had no name, but it's safe to assume that Chan returned in Batman & Robin as a different employee at Wayne Enterprises. Then again, you know what happens when you assume something, right? That's right. It pisses Batman off. Thanks to the power of the beard, we can stop assuming these things and start knowing everything. TOGETHER, THEY ARE AS ONE. The answer lies on the chin of Chan, for it is now supporting one of the most powerful forces the universe has ever seen: the Scientist Beard. Doctor Lee's Scientist Beard gives him full control of the world's most advanced telescope, which was graciously donated to Gotham's Observatory Restoration Project by Bruce Wayne. This telescope, coupled with multiple orbiting satellites, allows Dr. Lee to reflect light from any point in space and transmit the signal back to the Gotham Observatory. In other words, Doctor Lee and his Scientist Beard can see anything in the solar system at any given time. Now, that's power. But he probably used it to watch stupid cat videos or something.